Following my post earlier this month covering 5 witchy things to do on the New Moon, today I would like to cover 5 witchy things you can do on the Full Moon. This month, the Full Moon falls on the 22nd. Wonderfully, this is right before our 3 year wedding anniversary! Magic performed on the Full Moon can occur the day before, day of, or the day after, giving you 3 days to perform your magical workings. Some witches believe the power of the Full Moon can be used three days before and after the actual Full Moon, but I prefer the day before, of, and after for magical workings. This is the best time for magic involving personal growth, spiritual development, and cleansing. 1. Cleanse and charge your crystals. The Full Moon has wonderful cleansing and charging powers. Unlike other methods of cleansing, laying your crystals in the light of the Full Moon also charges them with the Moon's energy. Lay your crystals out in an area where the light of the moon will shine upon them. Learn more about cleansing crystals and empowering them in my previous posts. 2. Draw Down the moon. Drawing Down the Moon is a ritual where you pull the energy of the Goddess or Moon into yourself. Everyone experiences this differently, but everyone agrees it is a powerful experience. Establishing a connection helps you recharge and cleanse and will increase spell potency. 3. Healing ritual or spell. The Full Moon is a time of healing, just like the New Moon. Conduct spells or rituals centered around healing yourself and others. Use your charged quartz crystals or Draw Down the Moon to assist your magical workings. Cleanse your hearth, home, and self of negativity and draw healing energies to you. 4. Divination. It should come as no surprise that this would be on the list. The Full Moon has always been associated with divination and fortune telling. Use the power of the moon to cast your runes or tarot or read tea leaves. Physic powers are increased during this time. 5. Dream magic and Astral Projection. Dreams are especially potent around the Full Moon due to the increase in physic power at this time of the month. Use Mugwort to increase your power and travel the dream world to solve problems, bring healing, or foretell the future. You can learn more about dream magic, how to stimulate dreams, and astral projection in my previous posts. To learn more about the Full Moon and the other Moon Phases, please check out my Moon Magic Part 1: Moon Phases and Moon Magic Part 2: Monthly Magical Moons posts. What do you plan to do this Full Moon? I'd love to hear in the comments below! 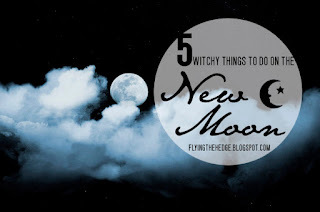 Well, the New Moon is right around the corner, April 7, 2016 to be exact, and I thought I would put together a list of five witchy things to do on the New Moon. Now remember, working with the New Moon begins on the day of the New Moon and ends three to three and a half days after the New Moon, so magical workings that take several days to complete are easily accommodated during this time. 1. Start a new project! The New Moon is a time for new beginnings so if there is a project you have been thinking about doing, this is the time to start it. Paint a room, create a talisman, start a blog, or begin a story, whatever you fancy. 2. Perform a job hunting spell or ritual. Being the time of new beginnings, this is a great time to perform a spell or ritual designed to find a new job or just increase prosperity. I know what I will be doing this coming new moon as I am on the hunt for a new job! 3. Meditate. The New Moon is also a time for self-reflection. Use meditation to reflect on your actions over the past month and see where you have grown and areas you need to work on. This is also a great time to meditate on self-love. Don't spend your time reflecting bringing yourself down; build yourself up. 4. Healing ritual or spell. The New Moon is also associated with healing and love. Use these energies to heal self doubt or hate, repair relationships, cure illness, or just recharge your own energies. 5. Reconnect with the Spirit and energies around you. While I don't personally believe in any deities, I do believe that everything has energy. During the peak of the New Moon, go outside and lay under the stars. Take a walk around the neighborhood or through a nearby forest. 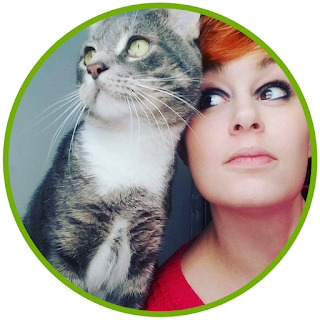 Reconnect with the Earth, plants, and other living creatures and most especially, the Moon. Even though the moon is not visible, this is one of the best times to draw on its power because it requires the use of your personal imagination and concentration. This is a great time to hone your skills. Don't let this opportunity pass you by. To learn more about the New Moon and the other Moon Phases, please check out my Moon Magic Part 1: Moon Phases and Moon Magic Part 2: Monthly Magical Moons posts. What do you plan to do this New Moon? I'd love to hear in the comments below!